Everybody in Miami — and probably most people in South Florida — know the office tower at 7880 Biscayne Boulevard as “the INS Building,” and for good reason. Since the U. S. Immigration and Naturalization Service moved in in April 1983, the building has been a flash point of protest, intrigue and controversy, as the many strands of Miami’s immigrant communities tense and relax. And thousands of Miami-area locals remember standing in line at the building awaiting immigration services. Now exMiami reports that developer Fifteen Group plans to redevelop the building as a residential property with 295 residential units and more than 30,000 square feet of retail space. Learning From Miami is interested not only in what’s standing on any given site, but what came before — and what may come next. 7880 Biscayne Boulevard was built in the early 1960s by the Gulf American Land Corporation, the land development company that built Golden Gate Estates and Cape Coral on the west coast. Designed by Steward-Skinner Associates of Miami, the building featured distinctive anodized aluminum sun screens. Even more commented upon was the building’s “tele-sign,” a lighted news ticker that can be seen in this vintage view of the building. The “tele-sign” marked the intersection of Northwest 79th Street and Biscayne Boulevard as a major Miami crossroads in the days before interstate highways. The intersection connected to Miami Beach on the east and Hialeah Park to the west. Motel Row was just south of the intersection and neighborhoods to the north, served by the Biscayne Plaza Shopping Center on the north side of 79th Street, created an urban node at 79th and Biscayne, just a few blocks south of Miami’s northern city limit. Looking into the Wolfson Archives’ vast collection of historic film and video, we found two clips that capture “before and after” views of the INS Building’s site. The first, black and white, segment of the clip above is an aerial view of Biscayne Boulevard before 7880 Biscayne went up. We believe the building’s site can be seen in this frame enlargement. That’s 79th Street running along the bottom of the shot, with the 7880 Biscayne site on the right. 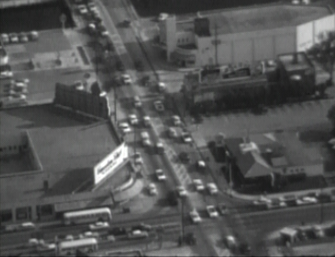 At the top right of this image is the Boulevard Theater, located on Biscayne Boulevard with the Little River behind it. The second, color portion of our clip is news b-roll of workers moving INS material — mainly millions of files, by the look of it — when the Immigration Service moved into the building in 1983. A glimpse of the building’s facade can be seen in this footage. The INS left the building in 2008. It seems that the redevelopment plans revealed by exMiami don’t include those shiny golden sun screens — and there’s no evident interest in re-installing the “tele-sign.” It will be interesting to see how area preservationists react to these plans. This entry was posted on Thursday, July 11th, 2013 at 4:49 pm and is filed under Preservation, Uncategorized, Videos, YouTube Video. You can follow any responses to this entry through the RSS 2.0 feed. Both comments and pings are currently closed.